9/11 WAS ORCHESTRATED to launch the Jewish hoax known as the War On Terror – with its preplanned wars and infringements upon our freedoms. The official account is that the World Trade Center buildings suffered spontaneous structural collapses Here. The alternative account put forth by Scholars For 9/11 Truth is that the WTC buildings were destroyed via controlled demolition by pre-positioned devices Here. — “9-11 was a false flag operation executed by a state-sponsored criminal network that required years of planning. False flag terrorism is a crime of terrorism designed by the architects to be blamed on their enemy. The media outlets which the criminals control stifle any independent analysis of the crime. It is obvious who is obstructing justice toward the victims. At every critical point where the events of 9-11 should have been investigated and discussed there has been a Zionist occupying a key position and acting as the censor of evidence – the gatekeeper of information.” — Here. Michael Chertoff: This Jew was the Assistant Attorney General at the time of the attack & responsible for the “non-investigation” of 9-11. 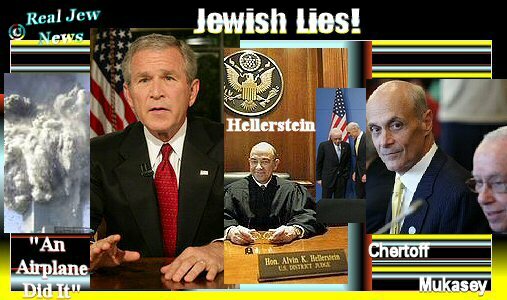 Chertoff, a Talmudic Jew, is a dual citizen of Israel & the United States. He is now the head of US Homeland Security. Chertoff confiscated all the crucial evidence of the 9/11 attack. This evidence includes physical pieces from the different aircraft involved. He is denying all available evidence to families of the victims citing “Sensitive Security Information Regulations” to block discovery of evidence. Chertoff allowed Israeli suspects to return to Israel without being investigated. These suspects were caught driving with explosives near the WTC on September 11, 2001. They were driving a moving van of a phony company, Urban Moving Systems, which was found to be a Mossad front company. 5 other Israeli suspects of Urban Moving Systems were seen on the roof of a nearby building videotaping and celebrating the destruction of the WTC. Chertoff also allowed these prime Jewish suspects to return to Israel. Obviously Chertoff has no loyalty to America. He is a miserable traitor who should be imprisoned for life. Alvin K. Hellerstein: This Jew continues to act as Federal Judge to oversee cases involving the 9-11 attacks. Hellerstein, a Talmudic Jew, has prevented discovery with respect to the cases of the families of the victims. Ellen Mariani, who lost her husband Neil on United Air Lines Flight 175, has been placed under a Gag Order by Hellerstein Here. Hellerstein’s wife is the current Treasurer of Americans for Israel and Torah, raising the question of conflict of interests. But Jews in power are never called into question for any of their crimes are they? In the days after the attacks, Mukasey worked behind closed doors seeing some of the first material witnesses detained by Federal authorities. These would have included the “five dancing Israelis” as mentioned above. For obvious reasons, the Zionist Mukasey, disallowed any further examinations of the Israelis Here. & Replace Them With Non-Zionist Christians Now!